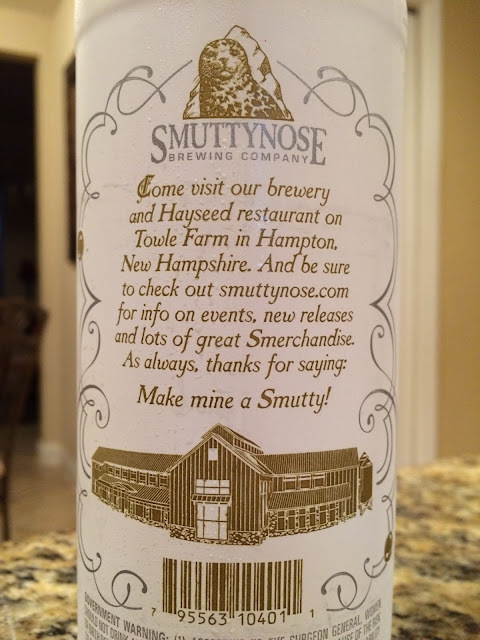 I was on the fence several weeks ago about forgetting about #BomberBoycott and purchasing a $12 bottle of Smuttynose Smistletoe brewed in the Biere de Garde style. Twitter buddy Norm told me it's one of the brewery's best, so going back to buy it was definitely a possibility. Also, you guys are geniuses, so I probably don't need to mention the play on words with the beer name and Mistletoe, #AmIRight? Anyway, a few days after Christmas, the liquor store discounted the few remaining bottles to $6 no-brainers. 2015 Smistletoe comes in a white painted bomber, very cool and festive, with silver and gold lettering. The back of the bottle is basically an invitation to stop by the brewery. 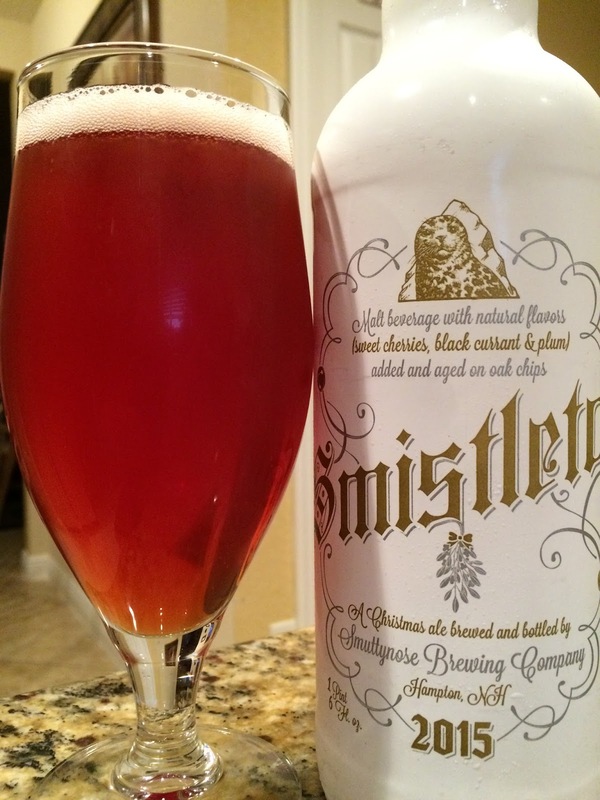 Nothing really sets you up for the style of beer you are drinking, though they definitely tell you your beer is brewed with sweet cherries, black currants and plums, then aged on lightly toasted American Oak. 8.5% alcohol. Not much aroma, light fruitiness and a touch of yeast, at best. Subtle fruit flavors to start as well, not tart, just a hint of sweetness. Cherries are noticeable first, then the currants with a distinct flavor. A little warmth does this beer justice for sure. A few cranbe(e)rry and floral notes start to show through. Some spice and interesting tanginess hit your palate. Lightly yeasty yet very tame. Oak? Well I don't taste any of that. And I'll be damned if that 8.5% alcohol isn't MIA! Flavors are very nice and tingle the senses, especially a little warmer. Made me make out with my wife with pretend mistletoe! (Yeah I know, how gross!) If you see a bottle, check it out! Or next year, if you have to wait!